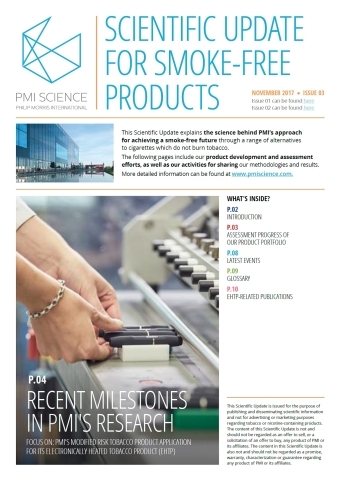 This issue of the Scientific Update focuses on PMI’s scientific assessment program as it applies to its Electronically Heated Tobacco Product (EHTP), referred to in the literature as the tobacco heating system (THS). PMI established its multi-step assessment program applying internationally accepted scientific and quality standards along the same principles as the US Food and Drug Administration (FDA) draft guidance (2012). The feature article outlines each step of the assessment program and summarizes key results of supporting data. Included is an overview of the more than 30 EHTP-related studies. PMI submitted this evidence to the FDA in the form of a modified risk tobacco product (MRTP) application. Beyond the MRTP-related content, the Scientific Update provides an overview of the assessment to date on its smoke-free product portfolio. The issue also covers key presentations at scientific conferences. It is an important complement to PMI’s ongoing efforts to share its latest science, which include a dedicated website (PMI Science). PMI’s extensive research and assessment program is inspired by the well-recognized practices of the pharmaceutical industry and in line with guidance of the U.S. FDA for MRTPs. The Company today employs over 400 world-class scientists, engineers and experts who conduct rigorous research, including laboratory and clinical studies, as well as ground-breaking systems toxicology. The assessment program also includes studies on actual product use and correct understanding of product communications, as well as post-market research. Philip Morris International Inc. (PMI) is a leading international tobacco company, with six of the world's top 15 international brands and products sold in more than 180 markets. In addition to the manufacture and sale of cigarettes, including Marlboro, the number one global cigarette brand, and other tobacco products, PMI is engaged in the development and commercialization of reduced-risk products (RRPs). RRPs is the term PMI uses to refer to products that present, are likely to present, or have the potential to present less risk of harm to smokers who switch to these products versus continued smoking. Through multidisciplinary capabilities in product development, state-of-the-art facilities, and industry-leading scientific substantiation, PMI aims to provide an RRP portfolio that meets a broad spectrum of adult smoker preferences and rigorous regulatory requirements. For more information, see PMI and PMI Science.